October 26, 2009 Agenda: "A Way Around Powerful Proxy Advisors?" DuPont Co. has discovered a new formula for fending off shareholders who want a voice in how the chemical giant compensates its top bosses: Get an outside second opinion. DuPont retained consultancy Soundboard Review Services LLC for a "fairness" judgment on how its directors set executive pay, according to a proxy statement filed by the company Friday. The advisory firm concluded those practices and processes are "sound," the proxy said. About a dozen other companies have recently hired the New York start-up to conduct similar reviews. Soundboard cofounders (left to right) William Coleman, Joshua Lurie and Gregory Taxin in White Plains, N.Y. The DuPont review didn't cover the amount or type of pay afforded executives, however. And critics are concerned the DuPont board is just buying good marks. Still, it is part of a wider effort by directors and management to find fresh ways of offering shareholders more information to deflect rising public anger over sizable executive rewards. "I wish shareholders had a full appreciation for the hard work" the DuPont board does "in setting executive compensation,'' said Gregory P. Taxin, chairman of Soundboard. Companies across the U.S. are grappling with increased shareholder requests for a bigger voice in executive pay. Resolutions that seek to give investors a nonbinding up or down vote on compensation packages came up at 79 companies last year, winning average support from about 46% of votes cast, according to RiskMetrics Group Inc.
Congress would require those "say on pay" votes at all companies under a Senate bill introduced March 15. A similar measure passed the House in December. Though results aren't binding, they can put pressure on boards to revamp practices. 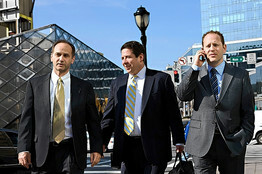 Mr. Taxin, a former chief executive of proxy advisers Glass, Lewis & Co., launched Soundboard last summer after he and co-founders concluded investors needed more information before deciding whether to back a say-on-pay resolution, how to vote if given a say on pay, or whether to re-elect directors involved in executive-pay decisions. He was joined by two ex-officials of Salary.com, a pay Web site. Boards pay the firm up front for a pay review that typically lasts several weeks and costs between $25,000 and $75,000. Clients decide whether to inform shareholders about the results. At DuPont, Soundboard interviewed executives, directors and the board's pay consultant. It also scrutinized confidential documents, including meeting minutes for the board pay panel, management proposals to alter pay and executives' performance reviews. The review didn't cover the merits, amounts or types of pay awarded, the proxy noted. Instead, Soundboard looked at whether the board pursued an "appropriate and effective" process in making executive-pay decisions, the proxy said. Mr. Taxin declined to say what weaknesses Soundboard uncovered in DuPont's pay practices, if any. Directors wouldn't hire Soundboard "if they felt any inadequacy or imperfection in their process was going to be revealed publicly before the board has a chance to fix it,'' Mr. Taxin explains. So far, Soundboard hasn't told other board clients that their executive-pay practices are terrible, either. Mr. Taxin says he isn't surprised because "nobody with crummy practices has come to us." DuPont's good marks could prompt its shareholders to reject a say on pay resolution for a third straight year when it comes up at the company's April 28 annual meeting. Last year, the measure garnered 46.1% of votes cast. In the proxy, DuPont directors call say on pay "a narrow, incomplete and ineffective means" for expressing shareholder concerns about executive compensation. Picking the right pay practices represents a complex task that the board compensation committee "is uniquely positioned" to handle, they added, citing the Soundboard review. "We will let the proxy stand for itself,'' said Lori Captain, a DuPont spokeswoman. Certain institutional shareholders don't like the idea of boards tapping hired guns to bless their oversight of compensation. While investors hunger for a fuller picture of executive pay, an outside review "bought for a stamp of approval" becomes worthless, says Ann Yerger, executive director of the Council of Institutional Investors. The Washington group represents more than 130 pension funds with more than $3 trillion in assets. The DuPont approach "is like paying a teacher for your good grades,'' contends Lisa Lindsley, director of capital strategies at the American Federation of State, County and Municipal Employees union. "It sounds like a poor use of shareholder resources." Other companies are taking different steps to invite outside input on compensation issues. Last year, Prudential Financial Inc. created a link on its Web site so investors could comment about its pay plans. The life insurer received fewer than 100 comments, recollects Margaret M. Foran, Prudential's chief governance officer. Among other things, the investor feedback helped persuade directors to alter incentive-pay programs—and hold a say-on-pay vote for the first time at the May 11 annual meeting. Investors overwhelmingly approved a 2009 resolution seeking that vote.